Will the 2018/2019 season be the most exciting onion campaign in years? Worldwide, the weather has had a major impact on the harvests. Not only Europe was plagued by heat, the mercury also rose high in California. Other parts of the US recorded a lot of rain, and the news coming from Asia were also not all good. That has resulted in tensions and speculation. Are there enough large sizes available? Is it advisable to sell now at a good price or gamble at the possibility of higher prices later in the season? Is the quality sufficient to keep the product in storage for all these months? So many questions, so many answers. We made an overview of the onion market. This year's sales figures are again unusual. With over 30 percent less yield, or about 40 tons per hectare, instead of the usual 60 tons, there are considerably fewer onions available for export. There are sufficient small and medium-sized onions available; however, the supply of large sizes is considerably smaller, and supers are also very rare. In the first half of the season, when good volumes of small and medium-sized onions are sold to West Africa in particular, exports won't be largely affected. However, after February, when the destination markets prefer larger sizes, the supply will likely be scarce, and there won't be enough smaller sizes available to compensate for this. The high price levels should naturally have a negative impact on the demand, but the fact that there will be more than 30 percent fewer onions in the Netherlands and more than 1 million tons less in Europe will have repercussions on the market. Some sorting companies wonder if there will be enough work for the second half of the season, as the weekly volume will barely reach 15,000 tons, while the sorting capacity exceeds 40,000 tons per week. The onion harvest is in full swing in the Iberian Peninsula, especially in the regions Castile-La Mancha, Valencia and Murcia. Even though most of the production has yet to be harvested, a smaller yield is expected compared to last year. This is mainly due to the frequent storms occasionally accompanied by hail. "The heavy rains in early September slowed the harvest down, but the quality is generally good," says a trader. This is especially true for onions that were not affected by hail. Spain could benefit from the shortage of large sizes in Europe this year, especially in the Netherlands. "In general, Spanish onions have a good size," says a grower. Provinces like Ciudad Real, in Castile-La Mancha (the most important cultivation area in Spain) certainly expect a good availability of large sizes. "We see the demand for large onions rising every day." At the moment, the price at origin oscillates between 0.18 and 0.20 Euro per kilo, although the market price is 0.28 Euro. As a result, the margins for traders are small. "At the moment, the price is on the low side, but it will rise by mid-October." At the moment, onion prices are almost twice as high as those recorded last year. A trader explains that "some of the growers have suffered losses of up to 40%, depending on the region and the production. However, the high and stable price compensates for those losses. "Normally, there is a great pressure on prices in this period. "Buyers normally want to push prices down as much as possible, but there is currently a certain unity among growers, traders and buyers, which is resulting in unusual market stability." The quality of the onions varies, so a lot has to be done in terms of sorting. "We have to make a great effort in order to deliver quality onions to our customers," says a trader. "At times, we are hardly able to meet the demand." The high demand suggests loyalty on the part of the consumers. Growers are satisfied with the price. Sales are developing well, which is a good thing, as the shelf life of onions in storage is not guaranteed to be long. "Normally, there is a peak in the demand just before Christmas, but it is a gamble to store the onions, instead of selling them for a good price." The situation will not change much in the future. In recent years, the market was not as exciting, so no major investments or acreage expansions are expected. A trader fears that the onion market will suffer from the dry weather of recent months. "Just like in the whole of northern Europe, the volumes available in France are well below the average. Because of this, the market will be turned upside down. We have to wait and see what the exact consequences will be." The dry weather is not the only factor that has caused a reduction in French volumes. Earlier this year, large areas in the country were hit by heavy rainfall. In the Cévennes, a known production area for sweet onions, 25% to 30% of the harvest was lost. The price increase that followed this was not enough to cover the losses. In any case, investments are still made in onion cultivation. A cooperative of 55 growers recently invested in a state-of-the-art handling plant with an optical sorter able to discover any imperfections in the onions, both on the inside and the outside. The 10 million Euro investment must ensure that product returns are reduced by 50%. The value of these is estimated at 300,000 Euro per year. The Ukrainian onion sector smells opportunities this year, given the fact that onions are smaller in many parts of Europe. The exporters are eager to fill the gaps left by Northern European countries. "Most competitors have now become customers," says an exporter. The European market is suffering a shortage of sizes 60 to 80. In Ukraine, sizes are also slightly smaller this year, but according to a trader, there are enough onions in the 80 to 100 mm category. The country not only exports to European countries, but also to Indonesia, Singapore and Malaysia. "We hope to gain a foothold in Asia," says an exporter, outlining ambitious plans for this unusual season. Growers are rounding off the harvest in California. The last onions are being harvested in the San Joaquin Valley. The season, which started in May, has been marked by good yields, despite the extreme heat in the summer months. Last year, the production stood at 6,767 trucks; this year, the figure has dropped slightly, to 6,620 trucks. The harvest kicked off in May in the area of Stockton with the first mild, sweet onions. In the weeks that followed, the harvest moved further north, towards the San Joaquin Valley, after which the supply shifted to the northwest and to Idaho. The market was weak this year for Californian onions. Those growers who were unable to sign contracts have had a challenging year. In other parts of the US, the weather has also determined the yield. "It looked like we would have a big harvest, but in Washington and northern Oregon we had a lot of rain in the summer months," says a trader. There was a lot of rain in other regions too, and the southwest also faced some climatic challenges. In general, the supply from the Columbia Basin has been similar to last year's, perhaps slightly smaller. Although growers may be able to take advantage from the global market conditions, the domestic demand is currently good. "I think we get a better demand when the harvest has been completed, the doors are closed and we know what we have," said a trader. In the Northwest, the growers are satisfied with the start of the season. The harvest kicked off on time and the weather has remained favorable. The only thing worth mentioning is the prospect of a greater availability of jumbo sizes this year. "The harvest started in August and since then everything has gone according to plan," says a trader. At the start of the season there was more demand for the white onions than for the other colors. Despite the positive messages, logistic costs will become a challenge in the coming period. With the holidays ahead, and given the persistent shortage of drivers, moving freight is expected to become more expensive in the fourth quarter. The onion harvest in Quebec is expected to be marked by a predominance of smaller sizes this year. It is a result of the hot weather recorded in July. In that month, the mercury rose to almost 40 degrees Celsius. The total harvest is expected to be similar to last year's. According to a trader, the smaller sizes are acceptable and consumers won't notice the difference, because it is just a matter of a few millimeters. However, the demand was delayed earlier this month. A trader said that the demand was lower than normal. Moreover, there may soon be a large volume available on the market if small growers without storage space decide to sell their onions. While last year's price oscillated between 17 and 18 dollars, this year it has stood at 15 dollars. In November and December, the demand will rise again, according to a trader. The Australian sector is preparing for the summer peak. Consequently, there will be a greater focus on international trade on the part of the exporters. 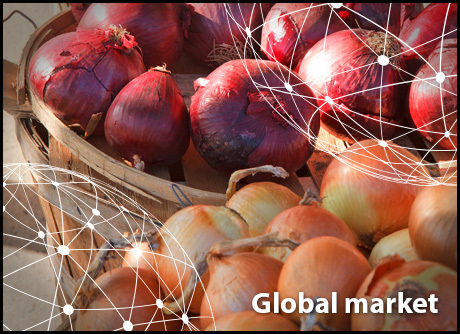 This year is the second one for Onions Australia, a five-year export plan targeting Asia and the Middle East as destinations. One of the challenges mentioned is an oversupply combined with a stagnating demand. According to the latest Hort Innovation figures (up to June 2017) the volume of onions has almost halved, from 43,888 tons in the previous year to 24,798 tons that year. The archipelago has a similar plan as neighboring Australia. By 2025, the export volume achieved in 2012 must have doubled. In 2012, the value of exports was 62 million dollars. By the end of 2016, this figure had already reached 116 million, so the sector is on course to meet its target. The sector also wants to boost the export volume to 330,000 tons; however, it has been warned that the cold recorded last winter will cause the production volume to fall. According to the industry organization, however, it is still too early to make any accurate statements in this regard. The season started in May this year with varying yields depending on the region. In some parts, the yield increased, while in other areas (including Shandong) the harvest volume was reduced. This has everything to do with the extreme weather conditions recorded, which have had major consequences for the harvest in certain areas. The export of the onions is slow. The demand from export markets such as Thailand, the Philippines, South Korea and Malaysia has fallen compared to last year. The situation is different for frozen onions, whose export continues to grow. These onions are shipped to Egypt, India, South America and Europe. The large harvest in Thailand and the Philippines is having an impact on Chinese prices. These countries exported a large volume to China, thereby putting the prices there under pressure. The sweet onion season started a few weeks ago and will continue until February next year. The US market has now switched to the import of Peruvian sweet onions. When the season ends, the US market will be taken over by Mexico and Georgia. The production in Peru is slightly smaller due to the cloudy weather. This has also had an impact on the sizes, which are smaller. According to a US importer, Peru has had an unusual season. Due to a lack of hours of sunshine, the sizes are smaller and the yield is lower. He speaks about an average production. The demand for sweet onions in the US is good; the sweet onions are sold for 18 dollars.